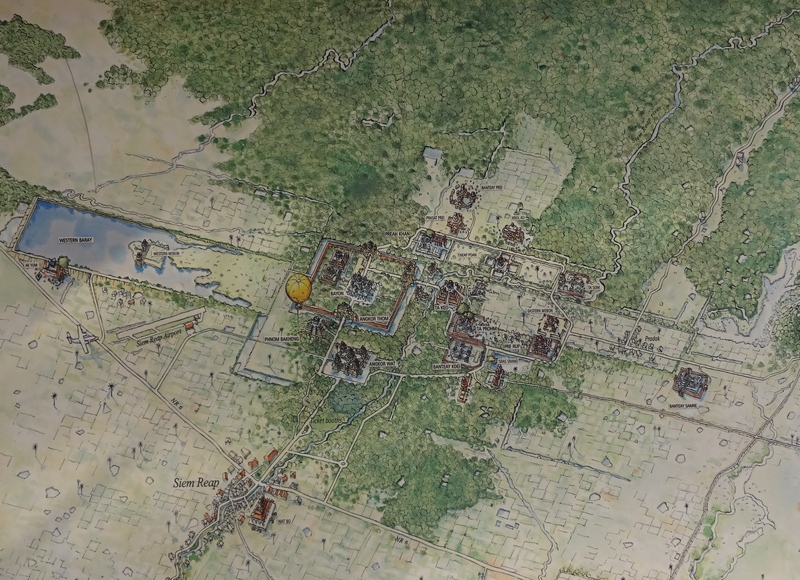 Map of temple complex north of Siem Reap (south central area of map). Angkor immediately north of city. Angkor Thom north of that. Banteay Srei at northeast corner of map. There are two sites in Siem Reap that I now consider bookends of the experience so far. Not being an experienced world traveler nor a historian, let alone an Asian historian, and this being my first visit to Cambodia, I nevertheless am arriving at a sense of this experience that will be anchoring my perspective for the remainder of my visit and beyond. Heading to the Angkor National Museum in Siem Reap should be a prerequisite to any other sightseeing. It’s not terribly large. I completed the tour in 2 hours and could easily have taken more time. They’ve done a very good job of tracing the scope and timeline of the Khmer kingdom from its origins (pre 9th C.) all the way to the post-Angkor period (post 13th C.) and the modern day. They don’t quite say what caused the demise of the Khmer empire. Suryavarman II, no doubt idealized. But only slightly, I’m sure. 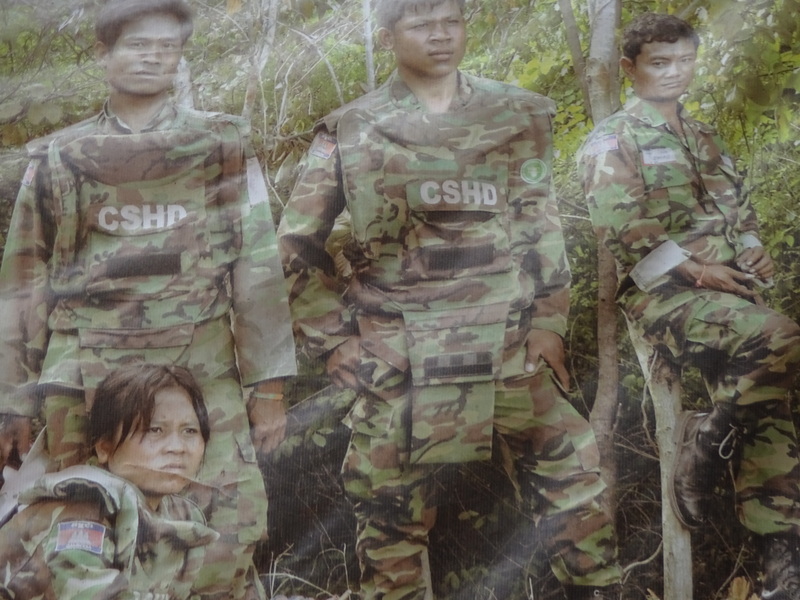 A succession of very effective, visionary and apparently very intelligent warrior kings expanded, solidified and maintained the Khmer kingdom for the better part of five centuries. They traded with friends, integrated ideas from afar, subdued enemies, expanded territory, cultivated the arts, introduced new technologies to their people, and generally took care of business. Not that I think it’s particularly cool to be making war on your neighbors. But you know, it’s been pretty easy to find excuses for that sort of thing for a long time. I hope we’re getting over it. But the point of the museum is that it offers depth and context to a particularly rich period of Khmer history which has become Cambodian history. The intense building period of the concentration of temples in the Siem Reap area occurred over two hundred years. Having now visited the museum, I will explore new places and also return to Angkor Wat with fresh eyes. Never mind the many current issues and imperfections of economics, government, education, health care or whatever, the heritage of the Khmer and the value to the world of the heritage sites is rightfully a deep and binding core element of the people. Contrast the experience of the Angkor Museum with that of another nearby installation, the National Landmine Museum and Relief Facility, located about 25 km north of the city. 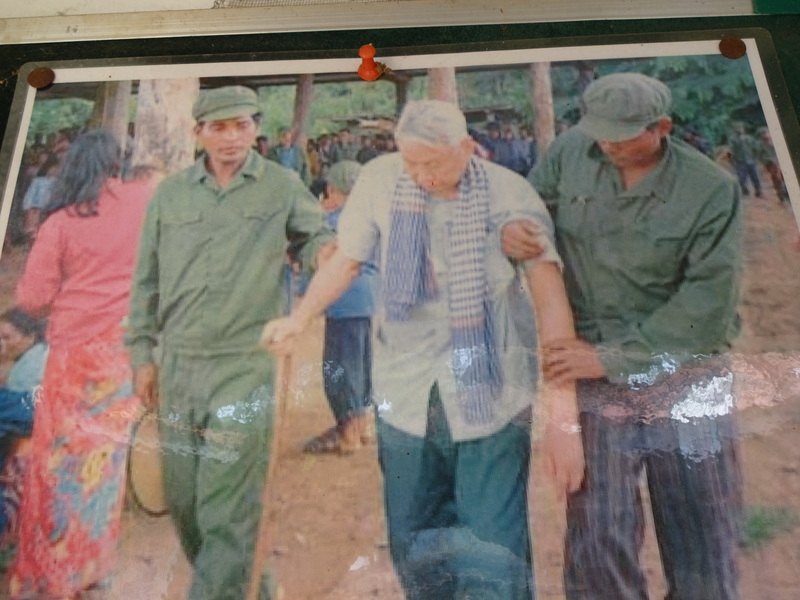 Here is demonstrated the artifacts and the legacy of the Khmer Rouge. Unless you see this place, or the Tuol Sleng Genocide Museum in Phnom Penh, it’s difficult to get a grip on the bitter, bloody and punishing anguish of that period and the ongoing effect it still has on the psyche of Cambodia. The Khmer Rouge could not have been more opposite to the more enlightened period of the Angkor kings. I don’t mean to be minimizing or whitewashing the reality of war in the 9th-13th centuries, but there was nothing of that time that compares to the homicidal ideology of Pol Pot and his comrades. Fully 2 million people perished either directly or indirectly as a result of the Khmer Rouge, a quarter of the population of the country. 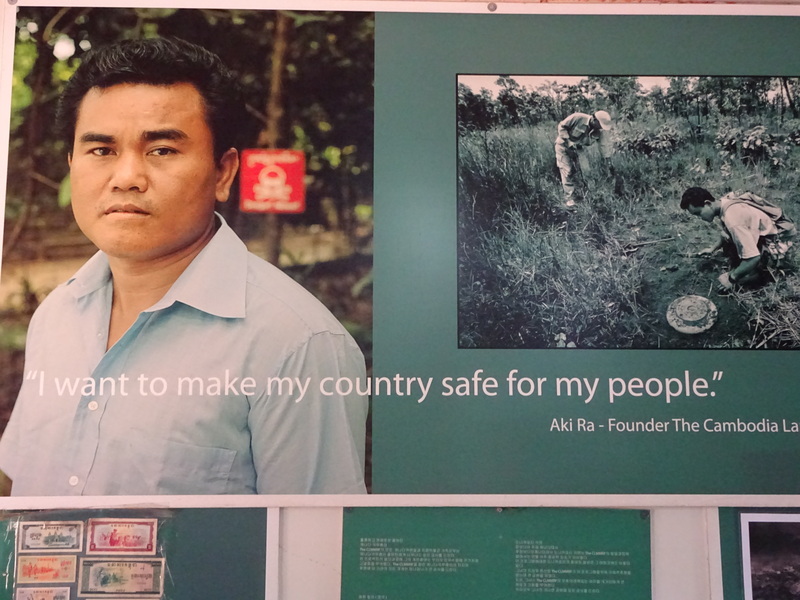 The Landmine Museum, started in 1997, is the work of Aki Ra, whose parents were killed by the Khmer Rough, who was kidnapped by the Khmer Rouge at age five and turned into a child soldier wielding an AK-47 at the age of ten. His story is one of healing himself, healing the land and making it safe for his people to occupy the territory from which so many were painfully ripped during that time. He started out improvising the detection and disarming of land mines one painful and risky acre at a time. He was joined by others who took up the task of ending the random maiming and death that has plagued rural communities all over the country to this day, a generation after the conflict ended. 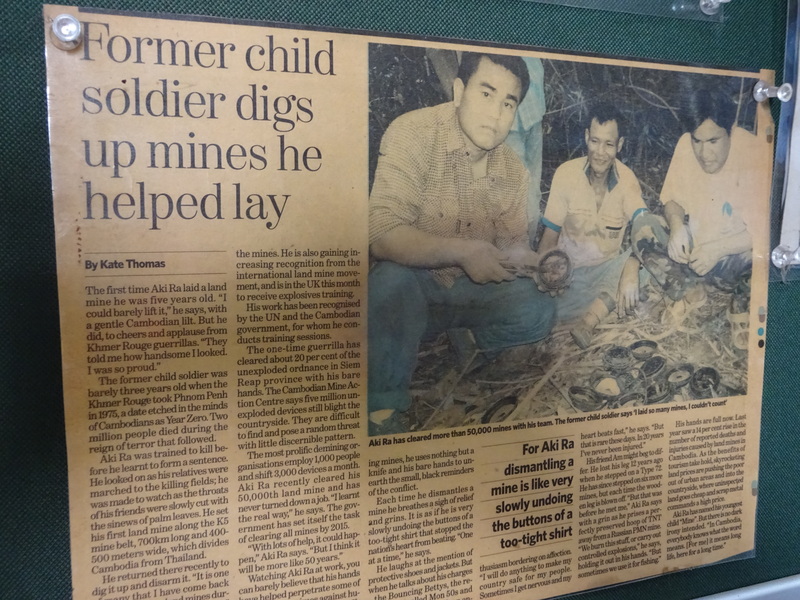 He has since been joined by others, improved the effectiveness and safety of the mine detection and destruction process, supported and guided numerous child victims of land mines toward healing and a productive adulthood, formed an NGO, been recognized internationally as a warrior for peace and continues his efforts with the same energy now as when he started. To me, Aki Ra is simply the embodiment of Restorative Justice. It is because of his work that others can overcome the horror of one of the most painful episodes in human history. For all the glory and richness that Khmer culture has given us, it is his work and the Landmine Museum that stand as a poignant reminder of the resolute nurturing and vigilance required to build a peaceful world. 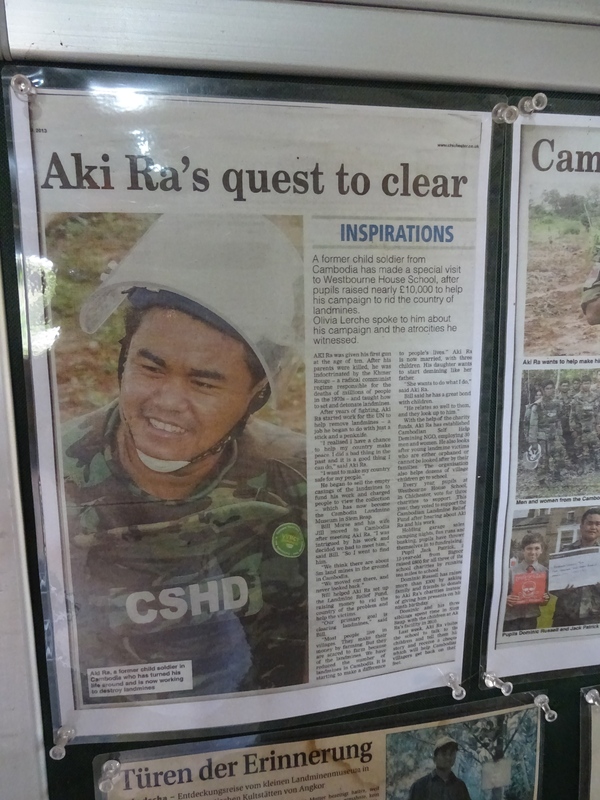 This entry was posted in Activism, Cambodia, Personal, Travel and tagged Aki Ra, Angkor National Museum, Cambodia, Cambodian genocide, Khmer Kingdom, Khmer Rouge, Landmine Museum, National Landmine and Relief Facility, National Landmine Museum, National Museum, Pol Pot, Siem Reap, Suryavarman II by garyhorvitz. Bookmark the permalink. The museum is simple, but very effective. Just like the man.